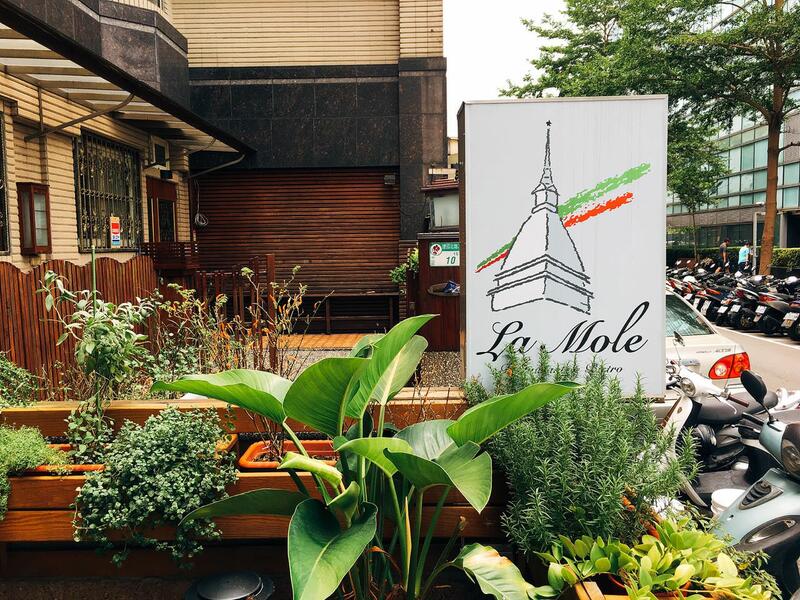 2017年初新開幕的LA MOLE TAIPEI 義式料理餐酒館位於建國北路與民權東路的晶宴會館附近, 義大利籍主廚的經歷豐富且年輕, 不惜成本地堅持使用最新鮮的食材作出更細緻的料理. 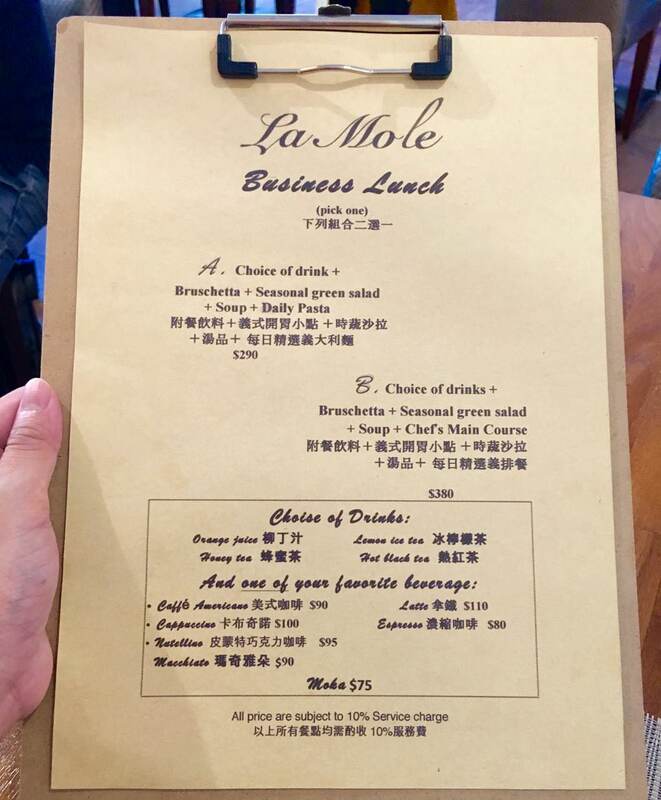 Newly-opened LA MOLE TAIPEI Italian restaurant is located near Jianguo North Road and Mínquan East Road. The Italian chef is experienced and also young, who insists on using the top quality ingredient to make the cuisines. 餐廳內座位非常地舒適, 甚至有提供大約12人的包廂, 戶外則是有多人座位區, 也可與餐廳主廚討論包場需要的客製餐點, 這些都是台北市大安區La Piola Cucina Italiana 義大利餐廳 跟 DOMANI 義大利餐廳無法做到的. 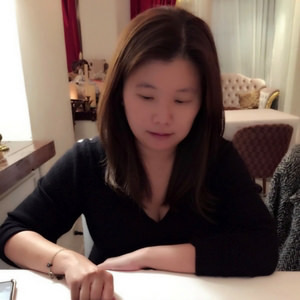 裝潢則是以木質系為主, 酒櫃裡擺放著多款葡萄酒, 義式濃縮咖啡機和多款酒杯整齊得放在吧台, 開放式廚房旁的冷藏櫃裡則是有熟成肉. The indoor seats are very comfortable. 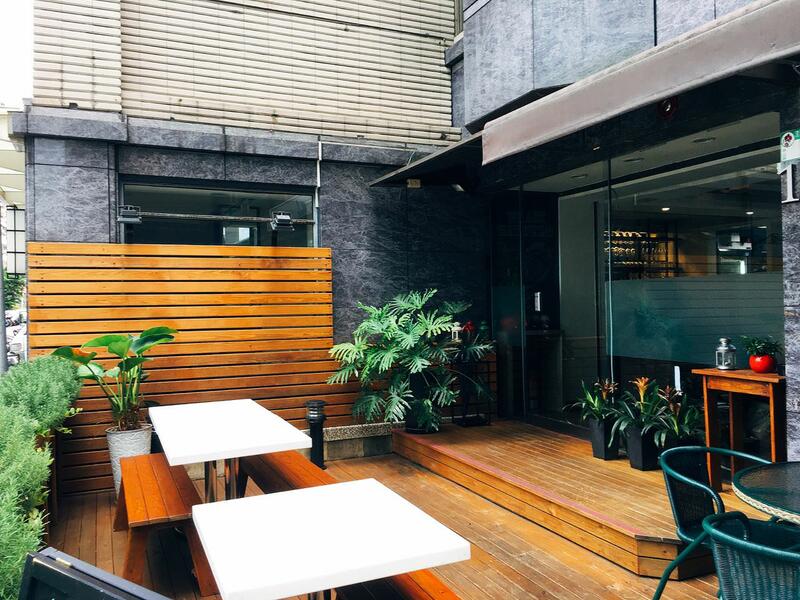 They also have outdoor seats along with private room for 12 customers maximum. 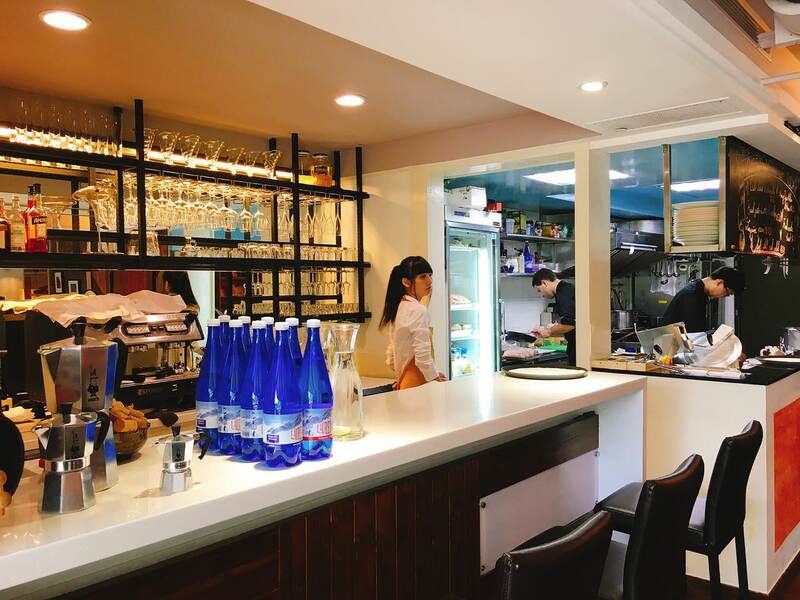 Unlike La Piola Cucina Italiana and Domani restaurant, they also offer custom-made dish for private parties that hosted at their restaurant as well. Besides the wine cabinet and expresso machine, they also have aged meat in the refrigerator near the opened kitchen. 為保持海鮮新鮮, 多種海鮮料理並不包括在餐廳的商業午餐內, 需要事先跟餐廳預訂. 偶爾會吃膩義大利麵的我則是會想點些不同的料理, 當我知道他們有限量且才$510元的炸軟殼蟹海鮮料理時, 毫不猶豫地就先跟餐廳預訂. In order to keep the seafood fresh, most seafood dishes would need to be reserved instead of ordering from restaurant’s lunch special. So, I didn’t hesitate to pre-order the “fried soft shell crabs dish” when the price is only NTD $510. 軟殼蟹其實不是螃蟹品種, 而是剛蛻殼不久, 身軀尚未經過2~3天鈣化變硬的螃蟹, 世界各地的料理皆可看到炸軟殼全蟹的料理, 在台灣最常見到的即是新東南中式餐廳的炸軟殼蟹和樂子Diner餐廳的炸軟殼蟹漢堡, LA MOLE TAIPEI 是我在台灣遇到第一家義式餐廳有提供炸軟殼蟹料理. 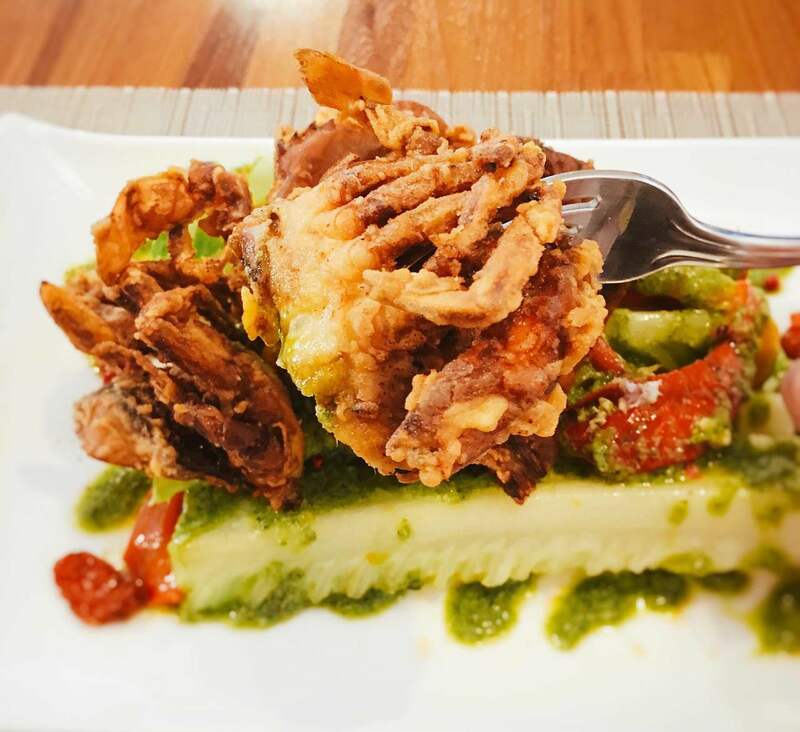 Soft Shell Crab is not a species. Instead, as the name stated, the crab’s shell is soft while changing its hard shell. 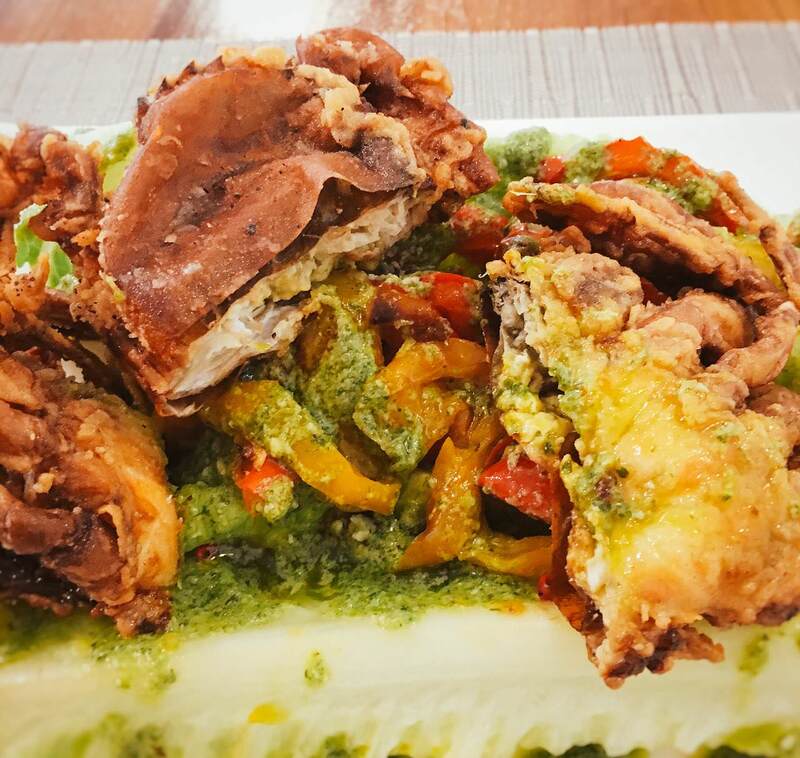 The fried soft shell crab dish is in most countries’ dish list. 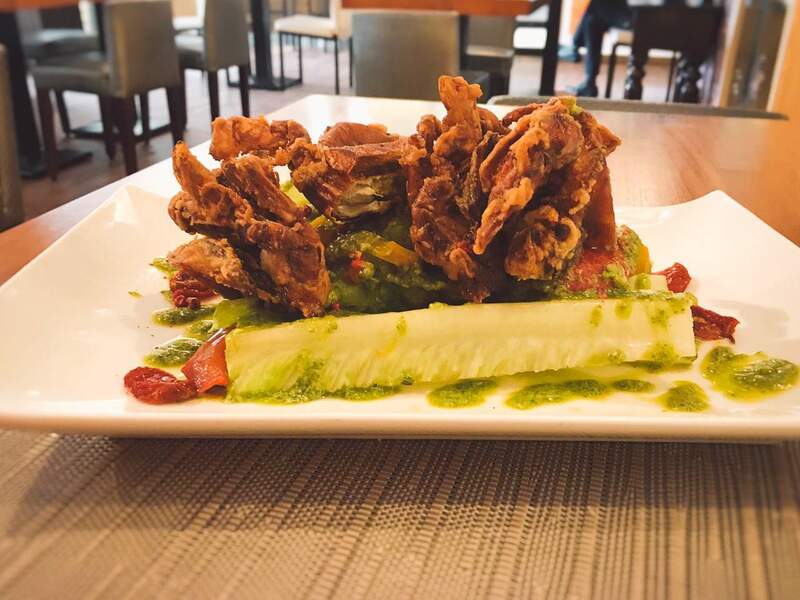 In Taiwan, there are XinDongNan Chinese restaurant and Diner Western Restaurant that offer fried soft shell crab dishes. LA MOLE TAIPEI is the first Italian restaurant that I came across offers this dish. 兩隻切半的中等體型褐紅色軟殼蟹放置在滿滿的翠綠色蘿蔓萵苣上, 毫不吝嗇地佐上深綠色的巴西里醬 (Parsley Sauce), 巴西里醬並不是台灣人常見的以羅勒為基底的Pesto青醬, 而是以荷蘭芹 (Parsley)和大蒜&橄欖油為基底的巴西里醬 (Parsley Sauce). 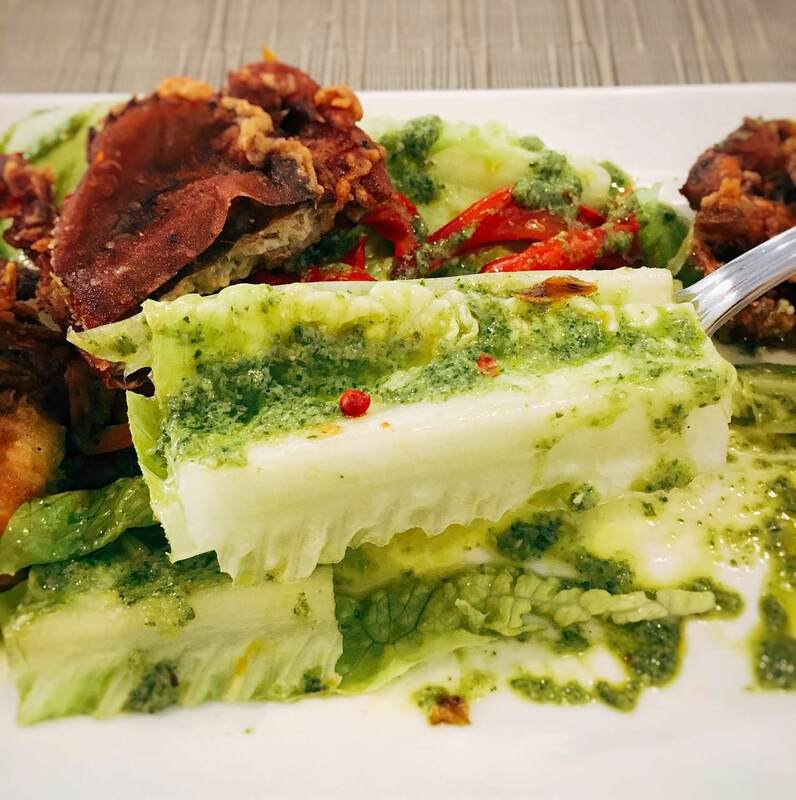 Two medium size brown-red fried crabs are placed at the top of light green Romaine Lettuce with fair amount of parsley sauce. this kind of sauce is not well-known pesto sauce, instead, it is made with parsley, garlic and olive oil. 每一口咬下酥脆的軟殼蟹都會發出“卡滋“的誘人聲響, 蟹肉與蟹殼並不會因為醬汁而變濕軟, 雖然荷蘭芹的清新香味被大蒜風味覆蓋住, 但與深藏不露的小番茄結合帶給料理鮮香酸甜的多層次風味, 清脆蘿蔓萵苣和紅黃椒口感極佳, 這是一道會讓人食慾大開的料理. Crunchy sounds appear after every bite at the crabs. 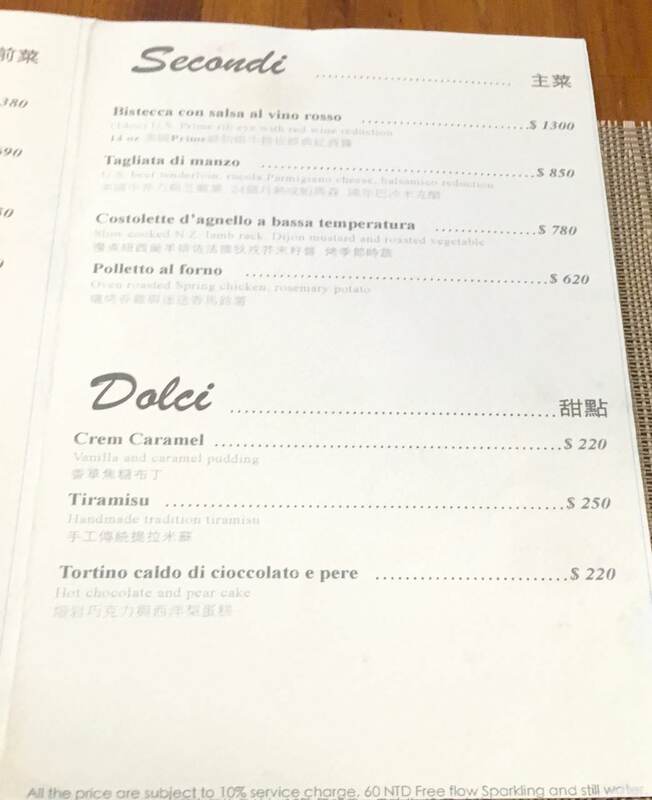 The meat and the shell didn’t get soft because of the sauce. The parsley unique aroma is covered by the garlic flavor. Pairing with the small tomato, this combination brings sweetness and acidity to this dish. Crisp romaine lettuce and sliced peppers are perfect pairing with this delicious dish. LA MOLE TAIPEI的自家製作法式麵包和小麵包棍是我在各家餐廳裡吃過最美味的佐餐麵包, 整體不會過硬, 少許鬆軟恰到好處. 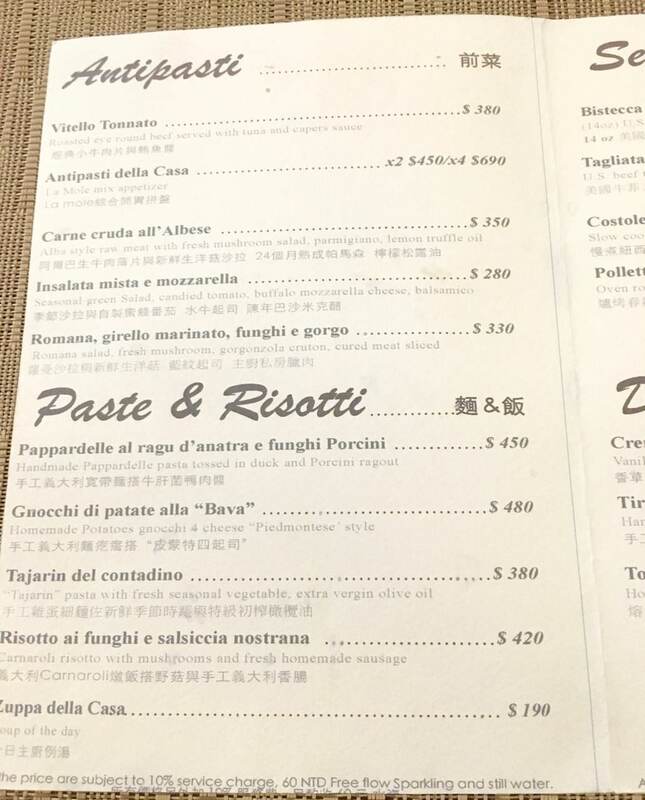 The restaurant makes their own bread. 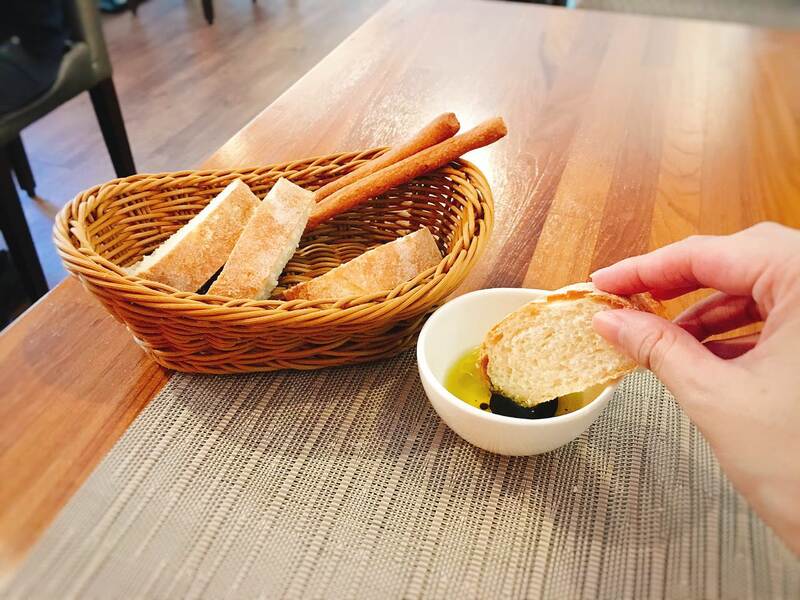 The soft french bread and bread stick are probably the best in town. 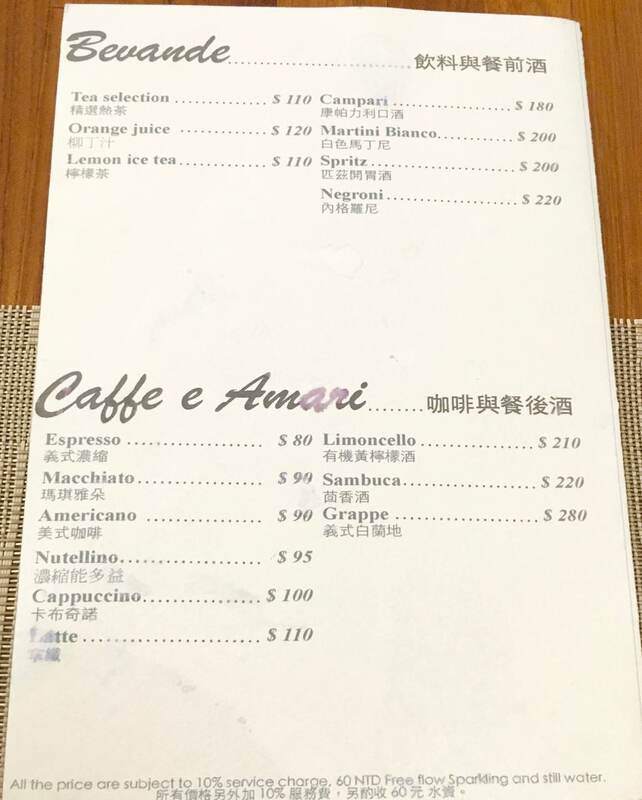 They charge NTD $60 per person for water. 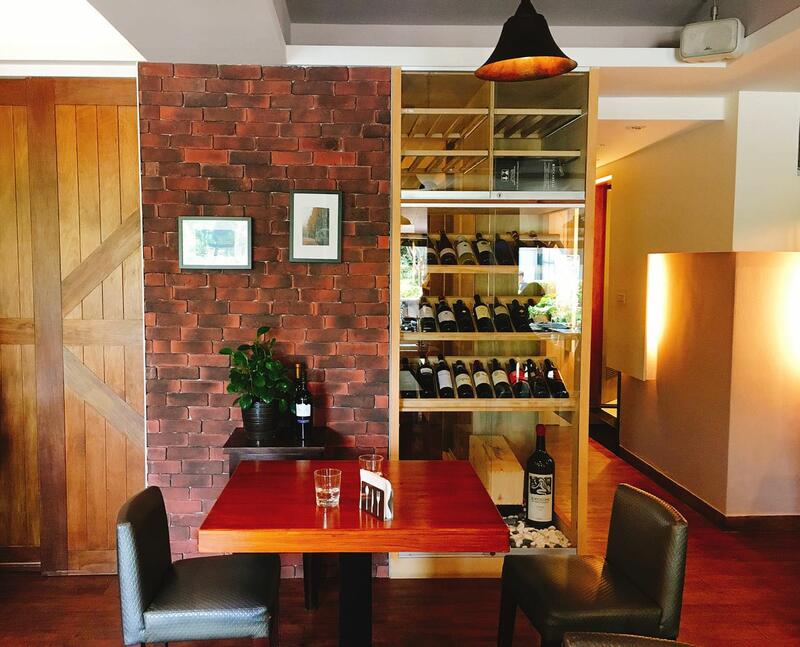 我點了一杯白酒來搭配炸軟殼蟹, 此款House Wine 全名為Castelforte Garganega Veronese 2015, 葡萄品種為 Garganega, 是釀造義大利Soave白酒的主要品種,金色酒體散發出萊姆與柑橘混合的香氣, 品酌一小口如預期地酸度高, 但並不會給予太多刺激感, 檸檬風味搭配海鮮特別合適. I ordered white wine for pairing with the dish. 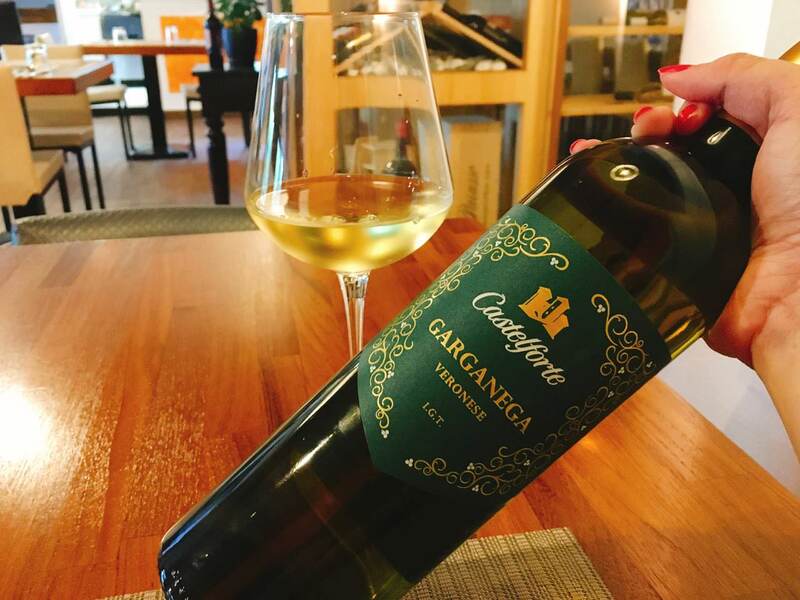 This House Wine is Castelforte Garganega Veronese 2015. The grape is Garganega, which is the main grape for producing Soave. Golden and crisp wine body has mixed lime and citric aroma. 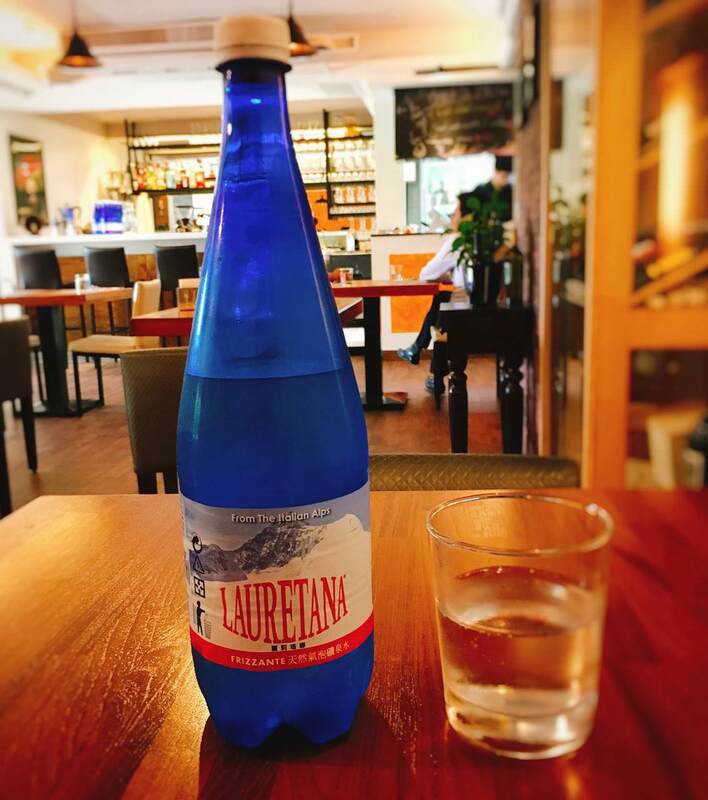 The high acidity is expected but didn’t impact the tastebuds too harshly. The lemon flavor paired greatly with the seafood.